I have not seen the new Finding Dory movie yet, but I am very excited to buy it when it comes out. I loved the first movie and I am hoping this one will be just as great. In honor of the movie I have plans for a few new blanket patterns. The first one is the clown fish blanket. 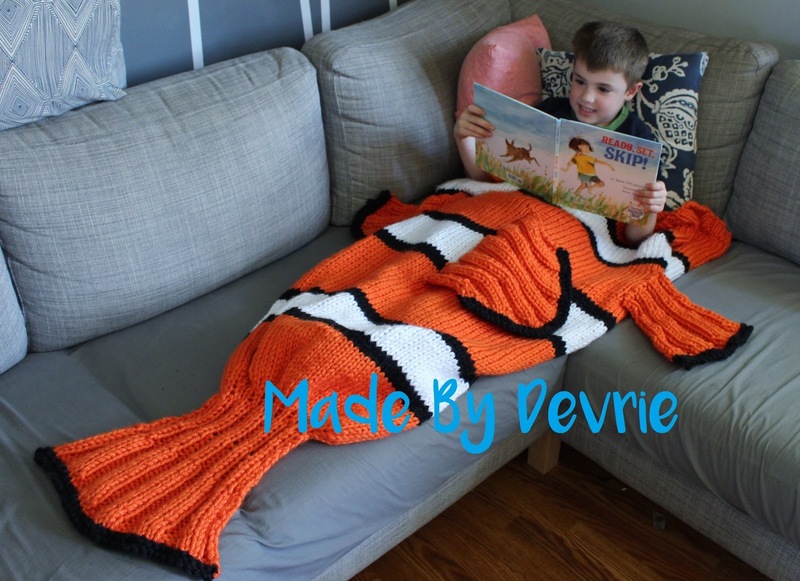 The Nemo Tail Blanket is made with bulky yarn so it is a quick knit. The top is flat making it easy to get into. The bottom is closed off like a sleeping bag so it keeps feet nice and warm. The pattern is available in toddler, child and adult sizes. Perfect for any size Nemo fan. I will be releasing the Dory blanket a shark blanket in the next week. Be on the look out for them. This new pattern is available in my Ravelry, Etsy, and Craftsy shops.